Type the word or phrase 'pruning tips' in any search engine and most likely you'll get results that tell you how to prune trees, as if the term pruning is only relevant to trees. Well folks, not here! Not in my world of home gardening. Every plant needs to be trimmed or pruned every once in a while, whether it's for health reasons or to encourage additional bloom. 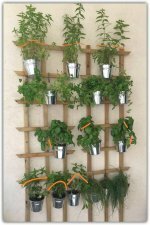 So when I created a pruning guide, I decided it would be from my perspective, which is all about how to prune the plants in your home garden. In the following pruning guide I'll provide you with pruning tips and techniques, so by the end of the guide you'll know all the how to's that you could possibly need and will be ready to move onto the when, and why. So let's begin with some general pruning guidelines. Stay on top. Yep, that's right. No matter the width of the stem, always cut from above. Of course you can prune from the sides, but I'm sure you'll agree with me that doing it right from the start is a better way to go - and if you're reading my pruning tips, it means you want to do it right. So, good for you!! and a special 'thank you' from your garden. Here's my point: when you place your shears on the branch make sure the cutting blade is on the top - above the branch or stem. why? Because pruning shears were design differently to scissors. Pruning shears need to handle strong thick stems, to do that they have two parts - the blade (above) and the anvil (beneath). The blade won't be able to cut unless it has something to counter it, and that's where the anvil comes in to play. 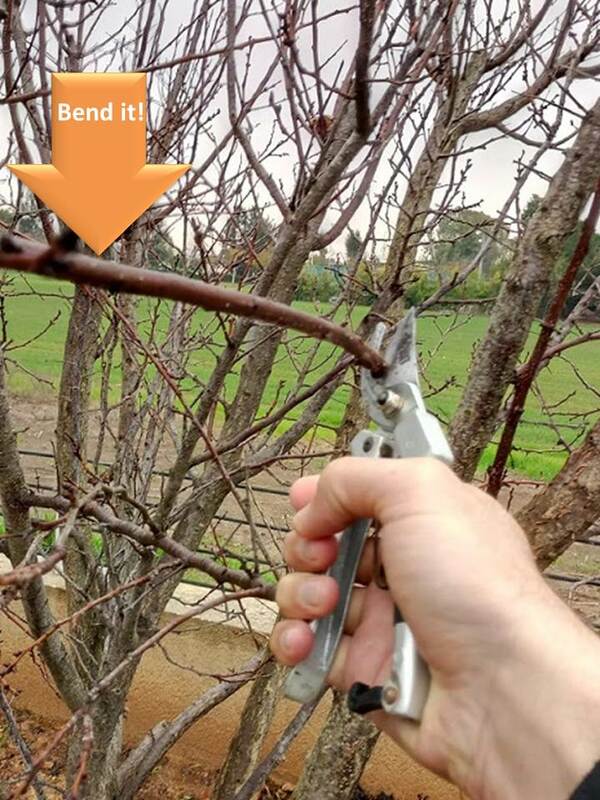 The combination of the structure of your pruning shears, together with your hand squeezing from above will give you the best results. Remember, these are only good habits, when the time comes you'll know when to do it 'right' and what is right for you. Cut it - See the sharp blades trying to take a bite of the branch in the above picture? See how the blade "Eats" most of the branch? Pruning shears were designed to prune both thick and thin branches (generally speaking). In order to get a clean cut on any twig, stem or branch, always try to bring the stem as close as you can to the inner part of your pruning shears. This will allow them not only to cover the whole stem, but will also require less effort and strength on your part. Why is a 'clean cut' so important? I'm glad you asked! 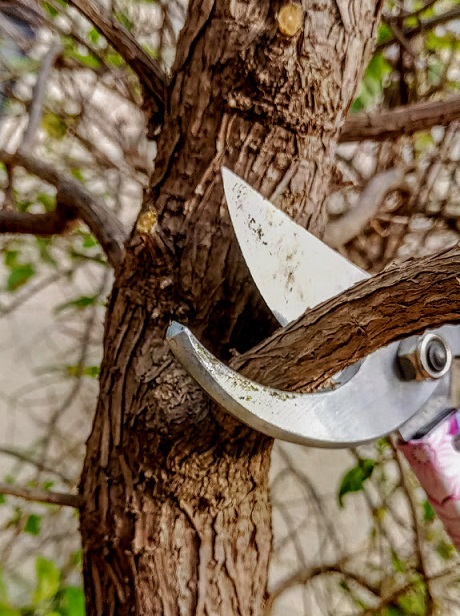 The act of pruning is a combination of contrasts, In most cases pruning will make your plant healthier, but at the same time you're wounding and hurting the plant. A clean cut reduces the pruned part's exposure to extreme weather, fungus and diseases which can harm your plant. That' also why it is so important to use high quality pruning shears. In the picture below you can see what a clean cut looks like (that's my rosemary shrub). 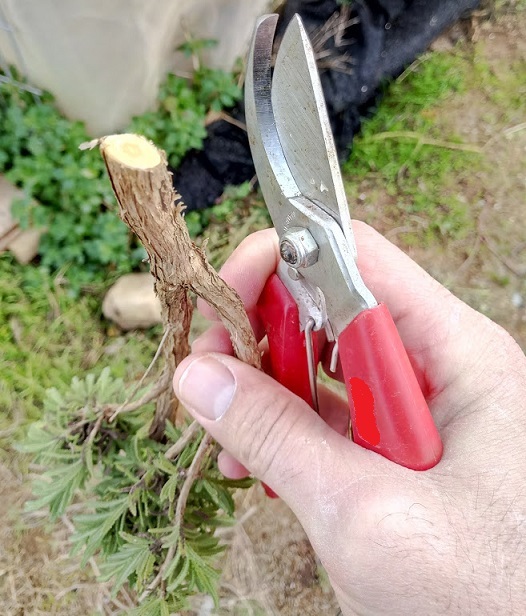 Cut & Twist - one of the most important pruning tips I can give you is to slightly twist your shears as you squeeze to cut and push the shears towards the ground (like slicing food) at the same time. This may require a little effort, but if you'll use the Cut & Twist technique you'll be surprised how much easier it becomes and how much softer the actual cutting will be. It makes a huge difference because what you are actually doing is using the sharp blade and the shears mechanism to minimize the effort, while still getting the best cut. Bend it - "Yes!! it really works", my daughter shouted out a few days ago when she tried to prune a thick woody sheba stem. Working with pruning shear doesn't require strength, it requires technique. the right technique can make a huge difference and allow even a little girl with small hands to successfully cut a thick stem with very little effort. 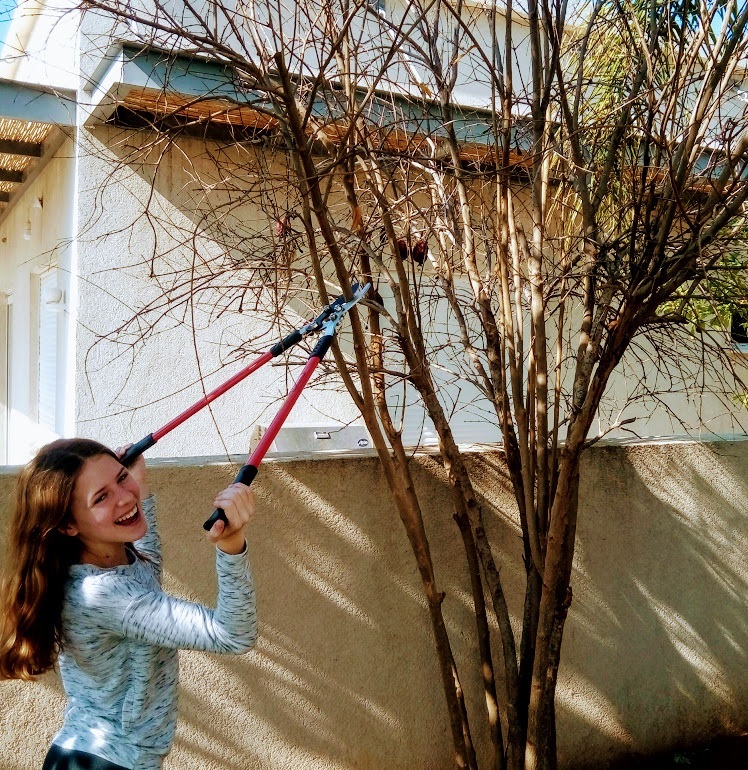 She used a method called 'bending the twig', which is simple, easy, fun and allows you to cut almost every plant in your home garden. Just watch and learn - one hand pushes the stem down while the second hand prunes it. But, do it it very gently, if you bend it down too hard it could snap. And although the idea is to prune the plant, breaking it like that would do more harm than good. Try it slowly, get a feel for how bendy or ridged the branch is and then cut. Regular check ups - I use the blade of my pruning shears to check the health and pulse of my plants. 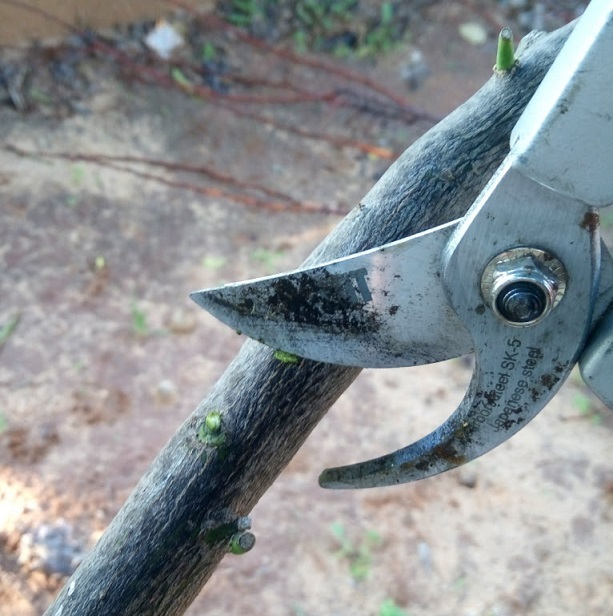 Scraping the stems outer layer every once in a while, or while pruning, will tell you exactly where you should prune. When holding a stem consider where to prune, or, if the stem looks 'dead' but your're not sure if it is dead or alive, gently scrape the outside peel using the blade and see if the layer below is green, or a little wet looking, like the inside of a stem. If it looks dry look for a new spot, that's still alive, and prune just beneath the test point. Do it over and over (the peeling the stem part) until you find a section of stem that is green or looks and feels wet. 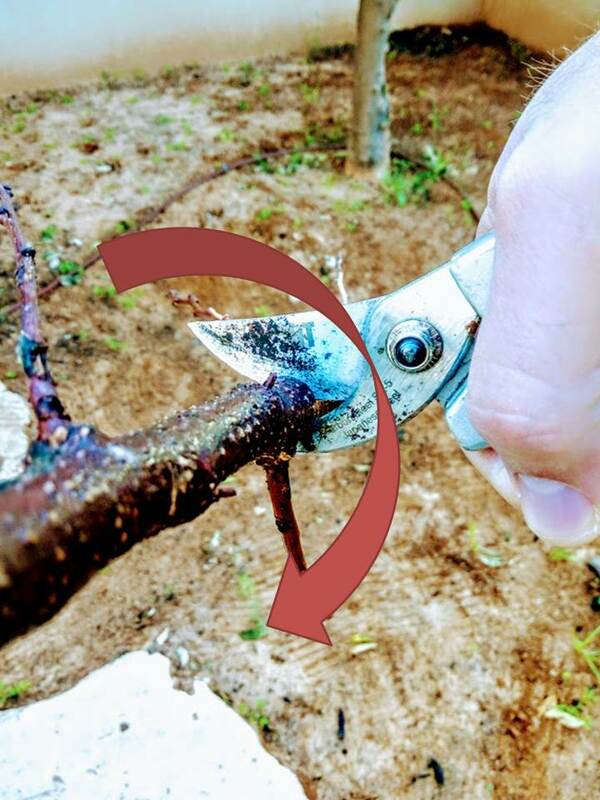 Best pruning tip you'll ever get! Just do it! (like Nike said) don't be afraid to prune. One last pruning tip: People often think that they might kill their plants by making the wrong cut. the truth is, it takes a lot of effort to kill a plant. Plants are strong. Of course there are some exceptions, hard pruning could be critical... but the majority of plants will survive your "huge" mistake. As a matter of fact, because people are often so afraid of pruning it wrong, when they do finally decide to prune they will most likely be so gently, that they hardly cut away anything at all - and that's not so great either. But hey, that's exactly what I'm here for, and please, you're more then welcome to ask me anything at all - 24/7. Use - what am I about to cut? thin stems? wide thick high density wooden branches? roses? suckers? flowers? all of the above? Size - It's important the shears feel comfortable in your hand, so you can use them over and over again. Quality - Without a doubt, in this case - quality counts. And its not just about the quality of the materials, good shears are critical to the health of your plant. I have seen many plants wounded by low quality shears. And hurt, wounded plants are absolutely not a must in your garden. Look & Feel - please don't be spartan, choose a great color and design. Once you've covered the first four rules, there is definitely place for wanting to looking good in the garden. My wife for example hates the feel of cold metal in her hands, so pruners with metal hand grips are not an option for her (she also says they look very masculine). She also has small hands, so the guideline for choosing her pair is to find small pruning shears with plastic covered hand grips. Keep reading for my full pruning shears buyers guide. If you need more information, have a topic you would like me to address, or if you have a comment for me - I'd love to hear from you. So, please don't hesitate, send me your input via The Pruning Centre.